148 Beacon is located on the north side of Beacon, between Berkeley and Clarendon, with 146 Beacon to the east and 150 Beacon to the west. 148 Beacon was designed by Parker, Thomas, and Rice, architects, and built in 1913-1914 by Walter A. Wentworth Co., builders, as the home of George Eddy Warren, a coal and oil distributor and shipper, and his wife, Frances Wightman (Knowles) Warren. They had lived temporarily at 143 Beacon during the 1913-1914 winter season. They also maintained a home in Manchester. George Warren is shown as the owner of 148 Beacon on the original building permit application, dated August 20, 1913. Architectural plans for the house — including the rear elevation, exterior details, floor plans, and floor framing plans — are included in the City of Boston Blueprints Collection in the Boston Public Library’s Arts Department (reference BIN L-14). 148 Beacon replaced an earlier townhouse, built ca. 1860, which had been the home of John Templeman Coolidge, Jr., and his wife, Anna Tucker (Parker) Coolidge. After their deaths, the house was acquired on February 3, 1913, by attorney Walter L. Van Kleeck, and was acquired from him on March 15, 1913, by Frances Warren. It was razed soon thereafter. Click here for an index to the deeds for 148 Beacon. George Warren died in May of 1935. Frances Warren continued to live at 148 Beacon and in Manchester until about 1943. The house was shown as vacant in the 1944 City Directory. On June 7, 1943, 148 Beacon was purchased from Frances Warren by Charles Ripley Lynde, an importer of China and glass. He and his wife, Helen L. (Fairbanks) Lynde, lived in Newton. On October 22, 1943, 148 Beacon was acquired from Charles Lynde by Nicholas Caracasis. In December of 1943, he married Ada (Aida) Mercedes (Bifolchi/Befolchi) Bullock, the former wife of Robert Joseph Bullock, and they made it their home. He was a restaurateur, owning Howard Johnson franchises in Dedham and Chestnut Hill, and also was the operator of the Pine Tree Inn in Onset and the Nantasket Beach Hotel. Ada Bullock was the operator of Ada Bullock’s Restaurant at 243 Tremont, at the corner of Stuart. Ada Bullock Caracasis’s daughter, Barbara Ann Bullock, lived with them, having taken the name Donna Dolores Caracasis. In the late 1940s, Nicholas Caracasis began using the name Donald (Don) Carlos. His wife and step-daughter also were known as Ada Carlos (or Ada Bullock Carlos) and Donna Dolores Carlos. On December 3, 1947, Nicholas Caracasis transferred 148 Beacon to his wife’s half-brother, Alfred George Silvestri. At that time he was a president of the Sherman Chocolate Company and lived in Quincy. On December 28, 1948, Alfred Silvestri transferred 148 Beacon to Donna Dolores Carlos Caracasis. On the same day, she transferred the property to Harold Karp, a lawyer. And on November 7, 1951, Harold Karp transferred the property to Ada Caracasis’s mother, Clara (Cleopatra) (Alberici) Bifolchi Silvestri. Donna Dolores Carlos Caracasis married in 1952 to Charles Fred Lochiatto. After their marriage, they lived in Jamaica Plain. 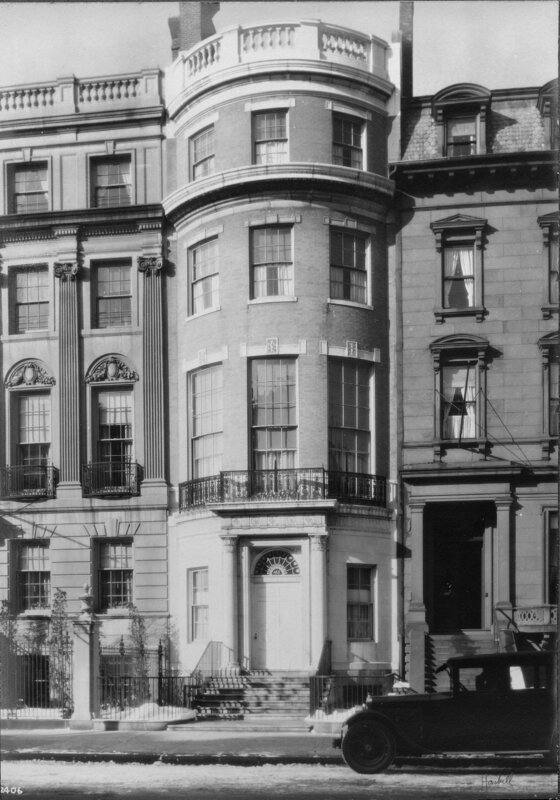 Nicholas and Ada Caracasis continued to live at 148 Beacon until about 1953, after which they lived with the Lochiattos in Jamaica Plain. On April 22, 1953, 148 Beacon was purchased from Clara Silvestri by Benjamin F. Sieve. On September 28, 1953, Joseph E. Levine foreclosed on his mortgage to Benjamin Sieve and sold 148 Beacon at public auction to Charles A. Turner. On October 5, 1953, 148 Beacon was acquired from Charles Turner by Eleanora (Eleo) Randolph Sears. She previously had lived at 87 Chestnut. She also owned 122 Beacon, where she had lived until about 1941; it had been the home of her parents, Frederick Richard Sears, Jr., and Eleanora (Coolidge) Sears. Eleo Sears continued to live at 148 Beacon until about 1965. On July 23, 1965, 148 Beacon was acquired from Eleo Sears by Edward S. Ryan. On September 30, 1966, 148 Beacon was acquired from Edward Ryan by Emerson College. In May of 1967, the college applied for (and subsequently received) permission to combine 148 Beacon and 150 Beacon, which it already owned, with the use of the combined buildings being as a school. In April of 1976, Emerson College filed for (and subsequently received) clarification that 148-150 Beacon was being used for dormitory and dining quarters, and in July of 1976, it filed for (and subsequently received) clarification that the upper floors could be used as a library. On September 27, 1999, Emerson College sold 148 Beacon to Joseph T. Doyle, Jr., trustee of the 148 Beacon Street Realty Trust, and sold 150 Beacon to the 150 Beacon Associates LLC. 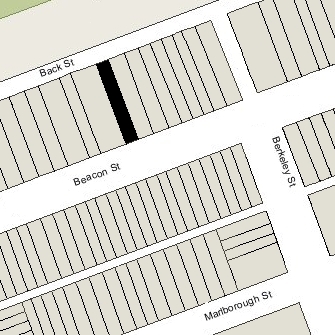 In December of 1999, Joseph Doyle, Jr., filed for (and subsequently received) permission to separate 148 Beacon from 150 Beacon, and in 2000 he filed for (and subsequently received) permission to convert 148 Beacon into two apartments. 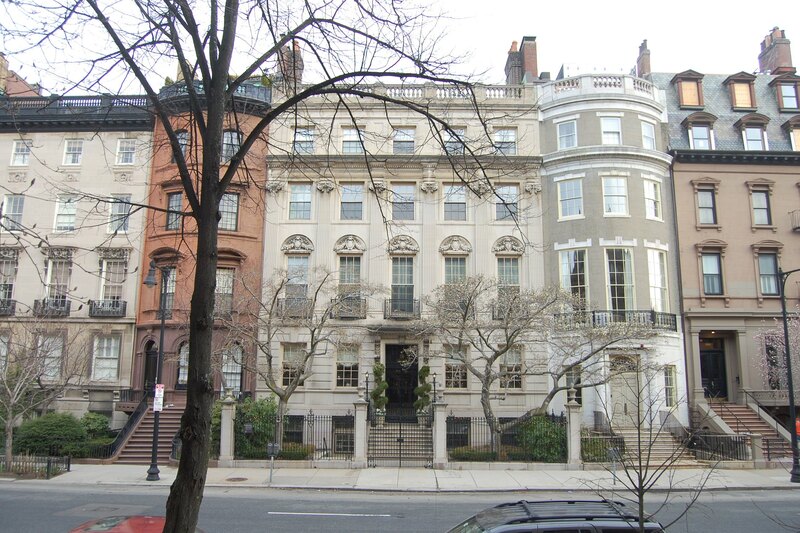 On March 3, 2004, Joseph Doyle, Jr., converted 148 Beacon into two condominium units, the 148 Beacon Street Condominium. 148 Beacon was built ca. 1860 as the home of John Templeman Coolidge, Jr., a merchant in the Calcutta and East India Trade, and his wife, Anna Tucker (Parker) Coolidge. It was originally numbered 124 Beacon, but re-numbered as 148 Beacon ca. 1862 when homes were built on the south side of the street. The Coolidges had married in March of 1860 and were the only residents of the house. 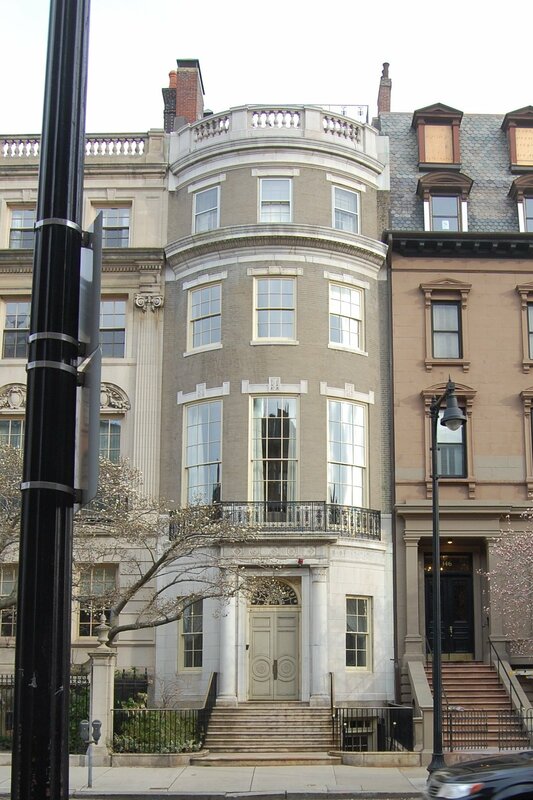 Prior to their marriage, John T. Coolidge, Jr., had lived with his parents at 108 Beacon. The land for 148 Beacon was purchased from the Boston and Roxbury Mill Corporation by Anna Parker on November 1, 1859, before her marriage to J. Templeman Coolidge, Jr. 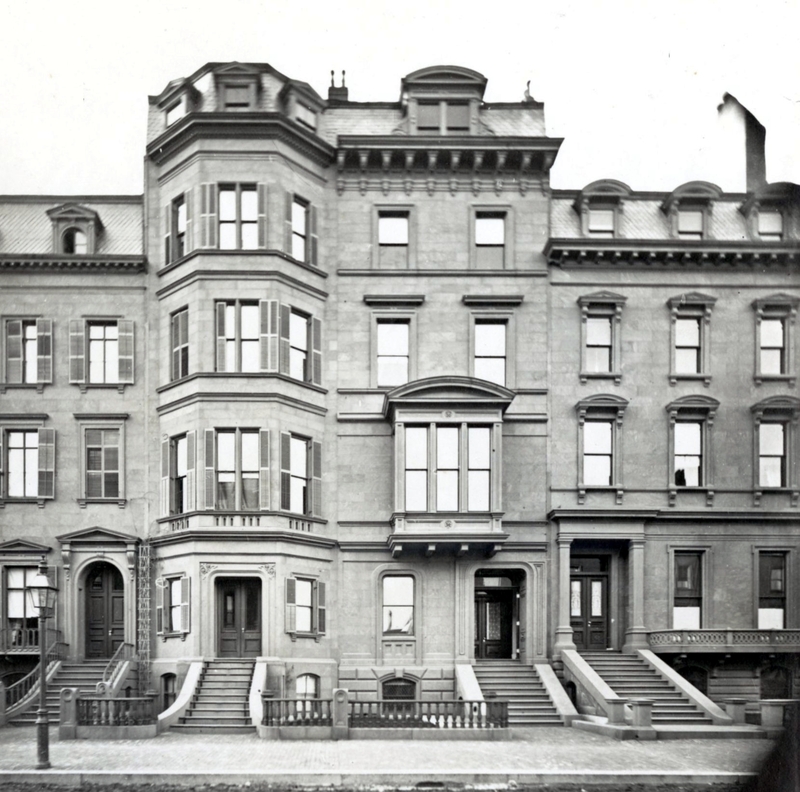 In January of 1862, her father, James Parker, a widower, purchased and moved to 144 Beacon. Anna (Parker) Coolidge died in October of 1899, and John T. Coolidge continued to live at 148 Beacon until his death in January of 1913. On February 3, 1913, 148 Beacon was acquired from Anna Coolidge’s estate and from the Perkins Institution for the Blind, the residurary devisee under her will, by Walter L. Van Kleeck, a lawyer. On March 15, 1913, it was acquired from him by Frances Wightman (Knowles) Warren, the wife of George Eddy Warren. They subsequently razed the house and built their new home in its place.